Some people like to travel by train, others prefer planes. I like ferries, and the bigger the ferry the better the ferry. The MV Fundy Rose, the ferry that makes the two-hour run between St. John, New Brunswick, and Digby, Nova Scotia, is a colossally big ferry. With mechanical jaws on both bow and stern, the 400-foot-long ship can swallow a buffet of tour buses, trailer trucks, motor homes, cars, motorcycles, and bicycles without so much as a blink or a burp. It’s so big, in fact, that once the lovely Catherine and I park our small rental car in the ship’s whale-deep belly, we must hop an escalator—no kidding—and then climb two stairways to reach an outdoor deck to enjoy the crossing in fresh Atlantic air and a caressing September sun. Did I mention the full-service bar mere meters away? It was a postcard perfect beginning to a 12-day, ferry-and-car-trip around Nova Scotia and its Cabot Trail with a quick swim to Prince Edward Island and two nights near Maine’s Acadia National Park. This trip, like most of our wanderings anymore, quickly falls into a familiar, easy pattern: overnight at a bed-and-breakfast; a puttering, two-to-four hour drive to the next night’s small town with a languid lunch somewhere along the way. Then, upon a mid-afternoon arrival, a slow, town-wide walking reconnaissance for a likely happy hour spot, a likely dinner spot, and a likely pastry-in-the-morning spot. All the slow moseying reveals the unchanging destination of every trip: our stomachs. We travel to eat and drink whatever is local, tasty, and in season. In Nova Scotia that’s both easy and hard. Easy in that seafood is at the center of every plate, bowl, and salad; hard in that you have to choose which ocean delight to enjoy. 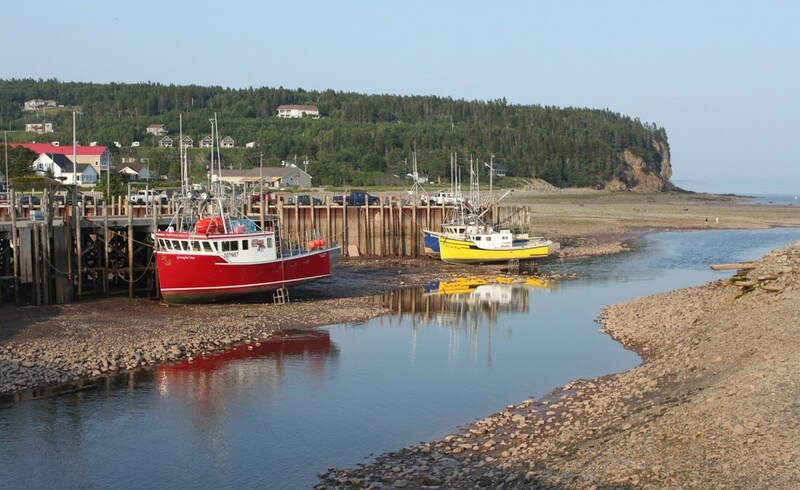 In Digby, the eastern terminus of the ferry, that choice is the town’s world-renowned scallops. Most are farmed in the broad, blue bay that shelters the tiny town, and all are fresher than tomorrow’s breeze. Down the road and around the southern coast two days later in Lunenburg, it’s lobster. Lobster bisque, lobster crepes, lobster quiche, and, yawn, just lobster. With the Canadian dollar equal to 78-cents U.S., our pocket change, the $1 loonies and $2 toonies our clever neighbors use, often covers lunch. Cape Breton and its coastal Cabot Trail offer windy shoreline hikes, hearty sack lunches on craggy, ocean-hugging hillsides, fresh cod dinners, and a Saturday evening of roiling Celtic music and cold Halifax beer. A day later we’re back on a ferry; this cruise, just an hour, delivers us to Prince Edward Island. After a week of touring forested Nova Scotia and scenic Cape Breton, the big island and its well-kept farms look more like southern England than maritime Canada. We arrive at 1 p.m. Sunday and PEI’s highways are as quiet and empty as its rural churches. We meander the back roads past browning potato fields and broad, ripening acres of low-bush blueberries. We had set sail for an island and somehow we landed in an Eden. Monday brings more slow roads, several walks on PEI’s windswept, iron-colored beaches and the best meal of the trip at a plain, side-of-the-road restaurant that we would have driven past had we not been tipped to it by the online “Yelp” app. Catherine (again) dives into PEI’s famous mussels, farmed in the ocean bays we can see from our table. We both order pan-seared halibut, fresh potatoes, and—oh my—just-made crème brulee topped with whipped cream and today’s blueberries. We then waddle to the car. Two days later we’re back in the homeland to spend a night each in Bar Harbor, then Portland, Maine, where I get my beef groove back with a medium rare rib eye as big as Rhode Island. The name of the terrific Portland restaurant? Grace, by golly, and the meal was all grace and goodness. The next day reality returns: flight delays and assembly line airport food. Both are forgettable but the delicious food and lovely sights of Nova Scotia and Prince Edward Island will never be forgotten.